Thanks to Courtney Carver’s lovely blog for this image and sentiment – go here to read her wonderful post and give a little of those things to others today and throughout the coming year. This was supposed to be a “ten on the 10th” post, but I let that deadline slip away (since this a ‘no pressure’ Christmas season). However I have had an enormous amount of fun making Christmas cards this year. When I sent off my overseas cards (only 15 of them) I was pleased that they were all handmade; what I had forgotten to do was take any pictures! I then had the task of recreating the designs for the New Zealand card list. It would be interesting to see the differences. As a relatively inexperienced card-maker, one of the criteria I use is that the design must be simple. As a pressed-for-time card-maker, the other is that I can construct the card in about 5 minutes. The design on the right is my ‘go to’ card design for all occasions (some of you might recognise it!) – and I think it works well as a Christmas card too. The design on the right (one I made up myself) is only possible in 5 minutes if you have a scoring board (but it’s quite possible to make without one, it will just take you longer). It’s another design that’s very adaptable to other occasions simply by changing the colours, papers and sentiment. 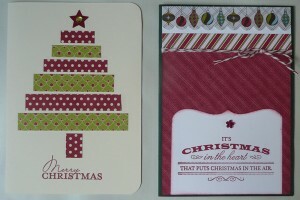 The card on the left is a Stampin’ Up! 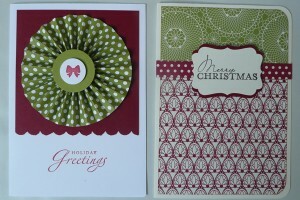 design, and the one on the right was inspired by a similar card I saw here at Carta Bella’s blog. 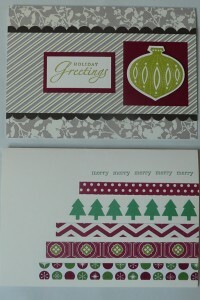 The card on the left is my own design – and uses a Stampin’ Up! ornament punch. 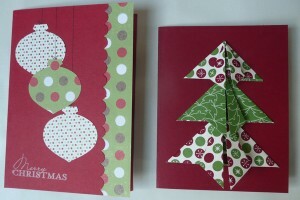 The origami card on the right was taught to me by Sarah Chapman in 2010, and looks more complicated than it is. 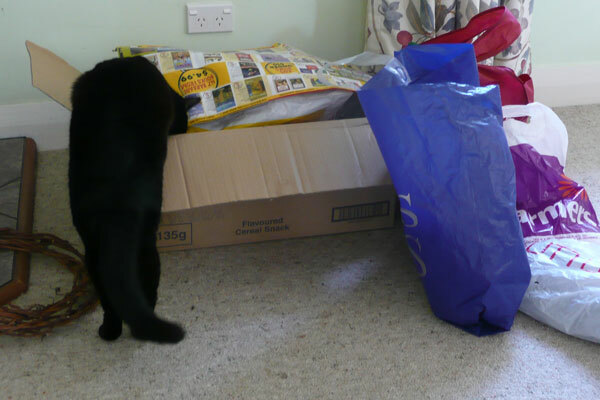 It took me a few goes to get the folding right, as 2010 was quite a long time ago! The top card is another Stampin’ Up! design, and the bottom one my own. The sentiment on the lower card is one of my favourites – it reads It’s Christmas in the heart that puts Christmas in the air. 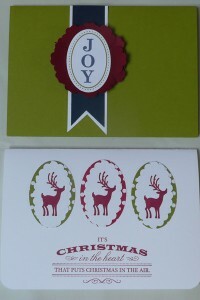 And last but not least, another ‘lifted from the internet’ design, and one from Stampin’ Up! These are two more examples of cards that can easily be adapted with different papers to become cards for other events. Now that I’ve completed this post I’d better get busy and send the cards out! In amongst the increasing busy-ness of the ‘getting ready for Christmas’ season, I am trying to make space for some daily reflection on what Christmas means to me, encouraged by the Journal Your Christmas class (yes, it’s Shimelle again). There are lots of items on my list of things that would make Christmas ‘perfect’, and I have given them all up. If they get done, then that’s great. If not, then that’s great too. 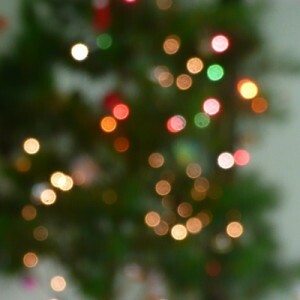 Far better to arrive at Christmas Eve feeling calm and relaxed than tense and stressed. So if the mood takes me, and I have time, I will bake shortbread and gingerbread. I will buy mince pies because I could never make enough to satisfy DH’s appetite for them. 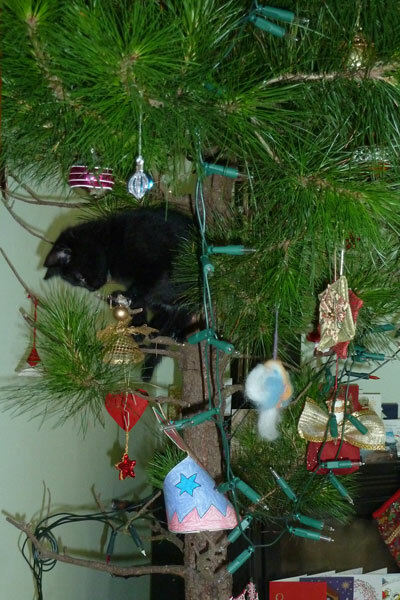 We will bring in the tree tomorrow and I will enjoy decorating it – and I will treasure the mixed colours of the decorations because they all have memories attached. It doesn’t have to be perfect to be good! Why not join me in giving up your ideas of ‘perfection’ this Christmas, and enjoy a ‘good enough’ Christmas with a little less stress? When I was a child one of the things that told me Christmas was coming was the steady arrival of parcels from Britain and Canada. I remember the British parcels in particular, because they were wrapped in a special sort of brown paper we don’t get in New Zealand – it’s almost striped, with a subtle tone-on-tone pattern, and a more rusty brown colour than ours. There were stamps – lots and lots of them – some with the Queen’s profile, others with a Christmas theme. I also remember the careful writing of my Aunts – Madge’s small tidy script and Sandra’s bolder, rounded hand, and my Dad’s sister Elaine’s untidy scrawl. The Canadian parcels didn’t have any string, but my Mum’s sisters clearly had a lower opinion of postal workers and had meters (yards, in those days!) of string and a multiplicity of knots to ensure the parcel would survive intact to its destination. In the absence of parcels, nowadays my countdown begins with making the Christmas Cake. True to tradition, I aim to make it on ‘stir-up Sunday’, the Sunday-next-before-Advent. It is so called because the Collect (prayer) for the day in the old 1662 Anglican Prayer Book begins “Stir up, O Lord, the hearts of thy people…” – and was taken as a useful reminder by the women of the congregation to get on with the job of making the traditional fruit cake. I was on time this year – and our cake will have a chance to improve not only with keeping, but also with a weekly brushing with brandy! 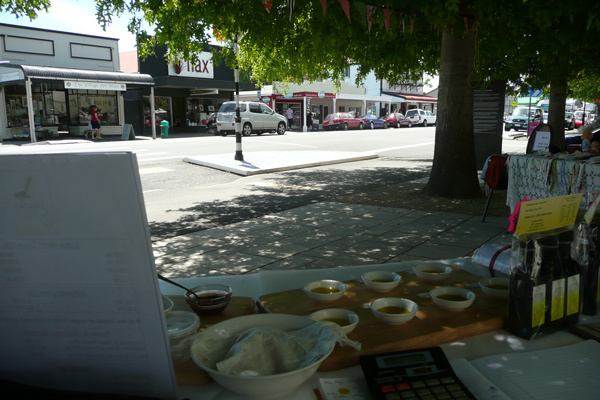 Today I performed another part of the Christmas countdown, and wrote and posted off the overseas cards. This year I’ve managed to make them all – nothing too fancy as I needed 16 cards and so I made a few each of several designs – none of which took longer than a few minutes to make. There are two really important parts of the process for me. The first is constructing a newsletter that rounds up the events of the year for each of us, and I love doing this. Looking back on the year gone by is a chance to reflect and enjoy again the highlights we have experienced. 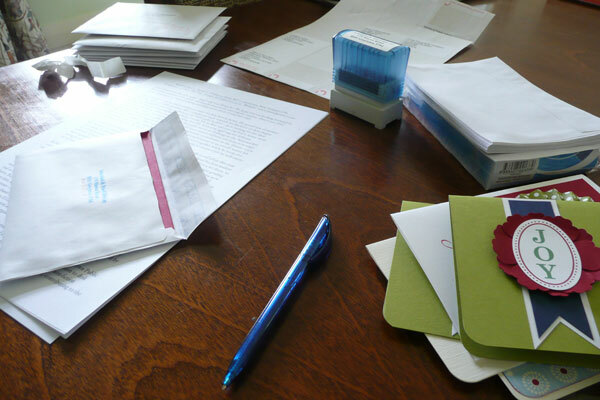 The second important part of writing the overseas cards is to write some words in each card that are chosen for that recipient. 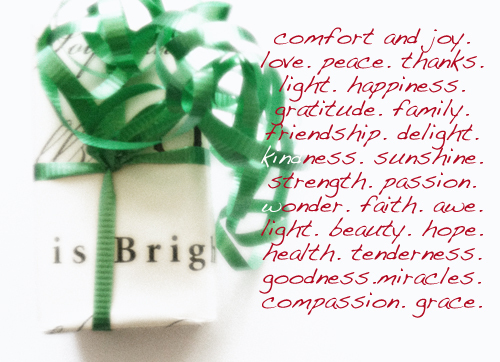 A little story, a wish or a shared memory – I like to add a little something special along with holiday greetings. What do you remember from your childhood countdown to Christmas? Is this still in your life, or has something else replaced it?